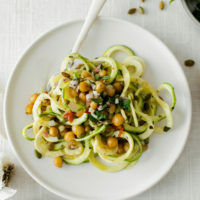 Chimichurri Chickpea Zucchini Noodles | Naturally.Chimichurri Chickpea Zucchini Noodles | Naturally. A light and simple lunch featuring chickpeas with chimichurri and zucchini noodles. Combine ingredients for chimichurri sauce in a small bowl. Whisk together until well combined. Let sit for 20 to 30 minutes before assembling. Heat a pan over medium heat. Add the olive oil followed by the slices of pepper. Cook until the peppers are soft. Add the chickpeas and cook until warm, 3 to 4 minutes. Stir in ¼ of the chimichurri and turn off the heat. Using a spiralizer, make the zucchini into noodles. Place in a bowl and add the chickpea mixture and toasted pepitas. Tips + Tricks: You will have leftover chimichurri, luckily I have quite a few ideas on how you can use it!